An outstanding long lived dwarf evergreen hedge plant which will grow slowly to about one metre, often seen shaped into cones and pyramids. It can be used to enclose a flower or herb bed. It requires good fertile soil which is not compacted and it benefits from a mulch of organic material such as grass clippings. 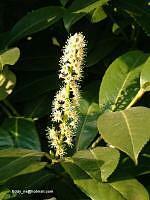 One of the very best hedge plants provided you can supply its demanding requirements. 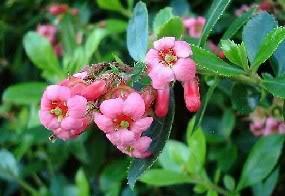 It requires good fertile well limed soil and it prefers shelter from strong winds. It is sensitive to sea salt and intolerant of dug out sites and ‘made up‘ ground. Outstanding evergreen plant with rounded apple green leaves tolerant of compacted and water logged soil and coastal exposure. The most versatile and easily managed of the evergreens it is easy to clip and the leaves are always shiny and blemish free. 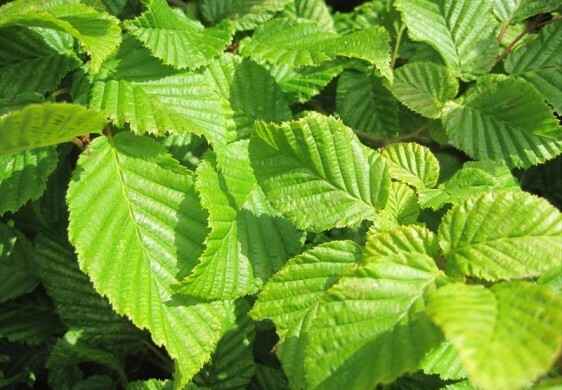 An outstanding deciduous native plant which was traditionally used to enclose fields and is now being planted in large numbers as part of the government REPS (rural environmental protection scheme). 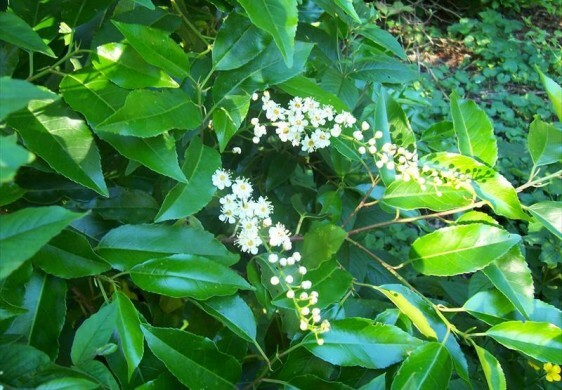 A thorny green hedge which is covered in white blossom in May and produces huge crops of red fruit called haws. Dark green shiny prickly leaves reflect the sunlight in mid winter and make a lovely sight. 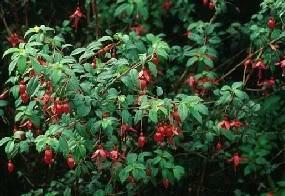 One of the best hedges, its red berries loved by birds, it is slow to establish but clips well to form an excellent hedge. Good salt tolerance. It will not tolerate poor drainage. An outstanding hedge plant whose green leaves change to yellow and orange in autumn and are fawn coloured on the plant throughout winter. 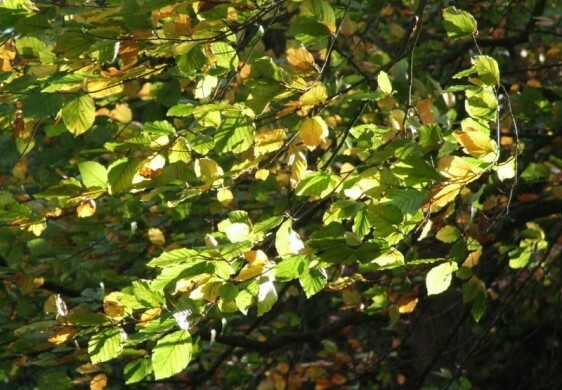 The leaf is similar to beech but hornbeam is a better in colder areas and where the clay is heavy. It will tolerate cold winds and exposure and heavy but not water logged sites. Outstanding large leaved evergreen plant up to 5 metres high, which makes a dense attractive long lived screen or wind break. It prefers good soil rich in organic matter and in areas where there is a lot of lime needs rich feeding to prevent the leaves going yellow. It will not tolerate poor drainage. 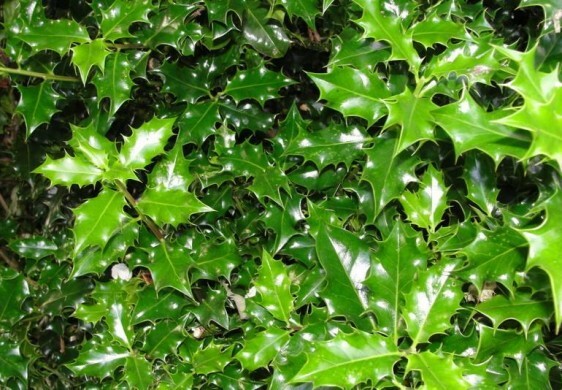 Outstanding large leaved evergreen plant, the green leaves having disinctive red stalks, up to 10 metres high, which makes a dense attractive long lived screen or wind break. It prefers good soil rich in organic matter. Tough versatile native plant very similiar to green privet to 3 metres high which is early into leaf and tolerant of maritime exposure. 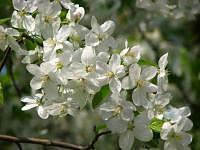 It produces scented creamy flowers and black berries. It is a good choice as part of a wildllife friendly hedge and it is host to the privet hawkmoth ‘Sphins ligustri’. 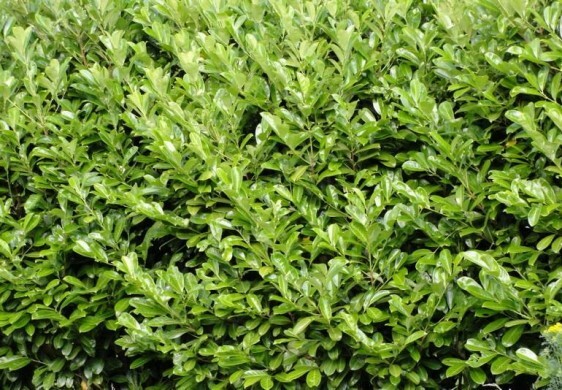 spaced at 45cm (1.5 ft) creates an evergreen hedge 6 to 8ft tall at a moderate growth rate. A hedge with crimson summer flowers that copes well by the sea. Not totally hardy, can be damaged by a hard frost. 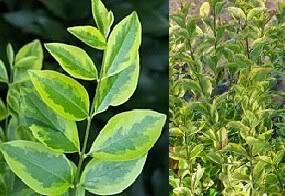 spaced at 45cm (1.5 ft) creates an deciduous (sheds and renews leaves annually) hedge 6ft tall at a rapid growth rate. A hedge with red summer flowers that copes well by the sea. 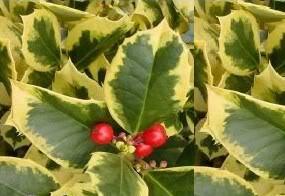 spaced at 30cm (1 ft) creates an evergreen hedge 6 to 8ft tall at a moderate growth rate. A hedge with decorative white scented flowers. 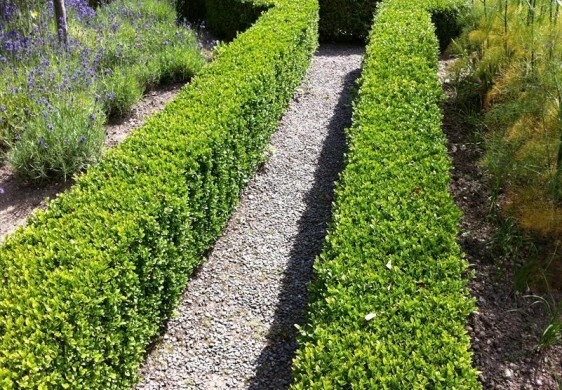 spaced at 90cm (3 ft) creates an evergreen hedge 10ft tall at a moderate growth rate. 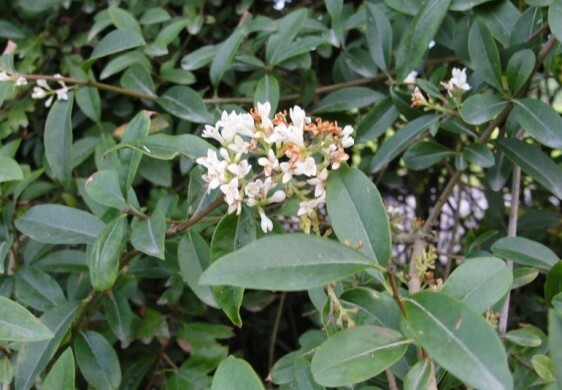 A hedge with white scented flowers and large glossy leaves. Copes well with shade. Creates a good screen, which can be cut back hard if needed. 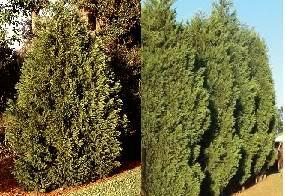 Spaced at 75cm (2.5 ft) creates an evergreen conifer hedge up to 60ft tall at a rapid growth rate.